In light of the threat Eastern Regional High School faced last week, school district re-examines safety policies and procedures. In light of the shooting threat Eastern Regional recently faced, the Voorhees Township Police Department hosted a school safety forum at Voorhees Middle School to discuss approaches towards school safety management. The panel, including members of the state senate, police department and police department, addressed community concerns. 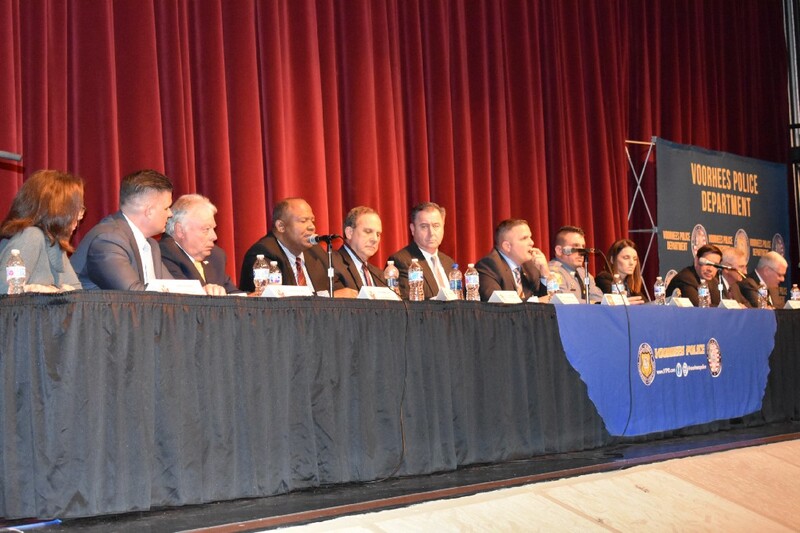 On Monday evening, local police, politicians, parents, educators and students convened in the Voorhees Middle School auditorium to discuss the township’s approach to school safety management. The school safety forum, whose panel included state Sen. James Beach and Assemblyman Louis Greenwald, was initiated in light of the mass shooting in Parkland, Fla., as well as the alleged terroristic threat made upon Eastern Regional High School a couple of weeks ago. As a result of the district’s lack of transparency, as described by parents, regarding the Feb. 15 arrest of Jacob Finkelstein, the 18-year-old who allegedly threatened to “shoot up” the high school, the middle school auditorium was filled to capacity with community members demanding not only answers but solutions. Along with Eastern Superintendent Harold Melleby and Principal Robert Tull, the panel included Mayor Michael Mignogna, Committeewoman Michelle Nocito and Police Chief Louis Bordi. He said, regarding the most recent incident, a delay in getting the police involved was identified. He said Nocito was the person who notified police about the threat on Feb. 15. Melleby also commented on the administration’s conduct in the aftermath of the recent threat. First, the VTPD will now have remote, or live, access to Eastern’s internal security cameras. Beginning Feb. 28, the administration will start conducting grade-level meetings to review safety procedures, including how to report suspicious activity. “We take all incidents and threats very seriously,” Tull said. According to Tull, Eastern recently also contacted the state Department of Education’s office of school preparedness and emergency planning to initiate a review of the district’s safety and communication protocols. The VTPD began highented school security plans in 2012 after the Sandy Hook shooting in Connecticut, according to Lt. Bill Walsh. Eventually, the program morphed into “round-the-clock” protection, entailing an armed VTPD officer at every school in the township, including Eastern. Walsh says Eastern has both school security officers and school resource officers. Despite the outline of current and potential security measures, community members, including students, did not hesitate to voice their concerns. “We’re always told that you’re not there, or you’re going to call us down, and we’re never called down. In that instance, what do we do from that point on?” she asked. Tull said that, after learning of a threat, the administration conducts its own investigation. If a threat takes place in a certain grade level, the vice principal of that grade will often handle the situation. “If, in fact, something doesn’t seem to be getting answered, then what happens is — we go back and see what things were missed, so we can take care of it,” he said. Smith said her question did not feel answered. Throughout the evening, dozens of parents expressed their worries about “holes” in Eastern’s security system, including open side doors, lack of officers before/after school, lack of officers on weekends, insufficient drills and the students’ little knowledge of procedures during a shooting. Some parents cited times when the school officers were reading newspapers as strangers straggled in through the front doors. Both parents and students say people can enter the school through multiple entrances, and students have noted times when teachers have left doors open during the day, as well. Throughout the evening, Greenwald advocated for Gov. Murphy’s ongoing gun control legislation, which emcompasses a series of regulations, such as ammunition limits and reversing Gov. Christie’s law that made it easier to carry concealed handguns in the state. However, aside from the state, parents pushed for more action to be taken at the township and district level. Donna DeCicco, a parent of a rising Eastern freshman, says one week after the Parkland shooting, she visited the high school and was brought into the building through a side door without being asked for her name or identification. “My child needs to show his school ID to get a chocolate milk, but I can get into the door without anyone knowing who I am,” DeCicco said. Parent Sharon Goodfellow questioned the frequency of school drills. Some students illustrated their frustrations with the district’s drills, as one senior said she had a hard time differentiating a “lockout” drill from a “lockdown.” Another student asked if there was anyway to verify the truth of a fire alarm, as in several mass shooting cases, including Parkland, the shooter set off alarms as a way to lure students out of classrooms, according to reports. Parents suggested innovative forms of security, including a hotline, a reliable phone line that won’t crash in the event of an emergency that goes to the district and that parents can use to determine the status of their children, in case of emergencies and installing metal detectors at the front entrance of the building. Del Palazzo said metal detectors present pros and cons, and the decision to invest in them rests with the school boards. But, if the administration does go forward with metal detectors, the police department would support that choice. As a whole, members of the panel agreed to consider the community’s input in moving forward. Nocito thanked everyone for attending the forum, including the board members, police and parents.